Feel the sound come alive all around you with our flagship sound bar featuring Dolby Atmos 3D surround sound with 7.1.2 channels. Maintain quality from source to screen with the latest 4K HDR support, plus HDCP 2.2. Enjoy the rich detail of Hi-Res Audio and a whole-home solution with Google Home compatibility and multi-room listening.2,6 All in a sleek, stylish design that looks great in any room. 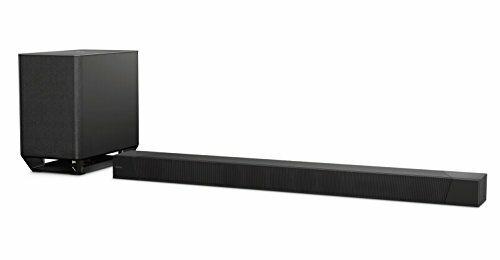 Consider the sound bar raised. Experience Dolby Atmos in a 7.1.2ch, 800W sound bar. Maintain quality from source to screen with 4K HDR support and HDCP 2.2 . Enjoy the rich, detail of Hi-Res Audio in a stylish design. Google Home compatibility and wireless multi-room listening. Receiver-like connectivity with 3 HDMI inputs, HDMI ARC and more. Enjoy high-quality streaming via Bluetooth.